T-3775440 is a novel potent, selecitve, irreversible LSD1 inhibitor with IC50 of 2.1 nM. T-3775440 hydrochloride is a potent, selecitve, irreversible LSD1 inhibitor. 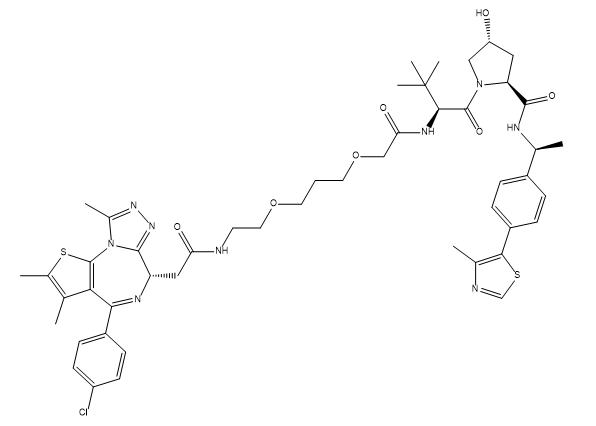 Corin is a dual inhibitor of histone lysine specific demethylase (LSD1) and histone deacetylase (HDAC), with a Ki(inact) of 110 nM for LSD1 and an IC50 of 147 nM for HDAC1. INCB054329 Racemate is a BET protein inhibitor. (S)-JQ-35 is an inhibitor of the Bromodomain and Extra-Terminal (BET) family bromodomain-containing proteins with potential antineoplastic activity. PROTAC BRD9 Degrader-1 is a lead PROTAC BRD9 chemical degrader (IC50=13.5 nM), which can be used as a selective probe useful for the study of BAF complex biology. PROTAC BET Degrader-1 is a potent BET degrader based on PROTAC, decreasing BRD2, BRD3, and BRD4 protein levels at low concentration. BRD4 degrader AT1 is an analogue of MZ1. It shows improved selectivity for BRD4 degradation.